The cabins are rustic wooden structures that have two rooms, sleeping 6 in each room. 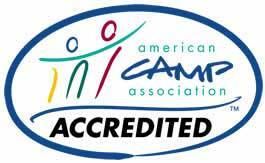 Generally, our older campers (ages 15-17) sleep in the cabins. They have bunk beds and shelves. 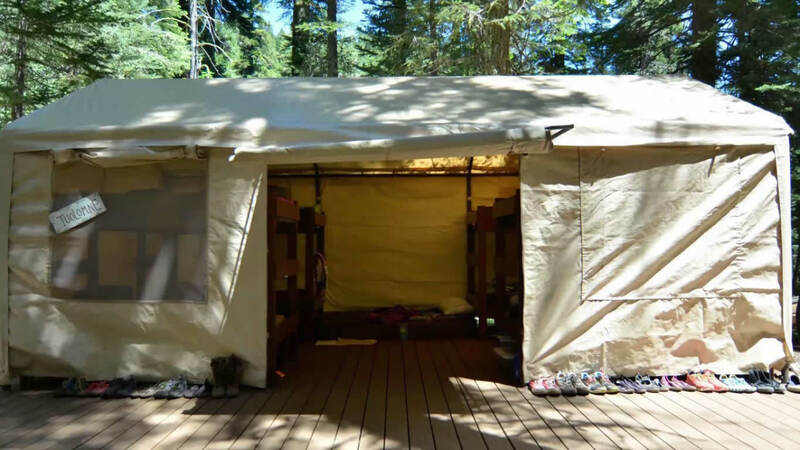 Most campers will stay in tent cabins, which we call "Miner's Tents" because they are walled tents reminiscent of the miner's tents used during the gold rush not too far from Camp. There are eight Miner's Tents, which are pitched on a deck up off the ground. Each deck has one walled tent. Each tent has 4 bunk beds and sleep a total of 8 (one counselor and 7 campers). Our youngest campers will stay in tipis. These tipis are large (20'+) and sleep up to one counselor and 6 campers on 5" thick foam mattresses on a tarped floor. These are particularly well-suited for fostering community building and are a great way to introduce kids to the great outdoors. All kids use the bathhouse for private showers and real flush toilets.